Rastakhan's Rumble card reveals continue with Gonk, the Raptor (Druid Legendary), Bog Slosher (Rare Shaman minion), and Linecracker (Epic minion). 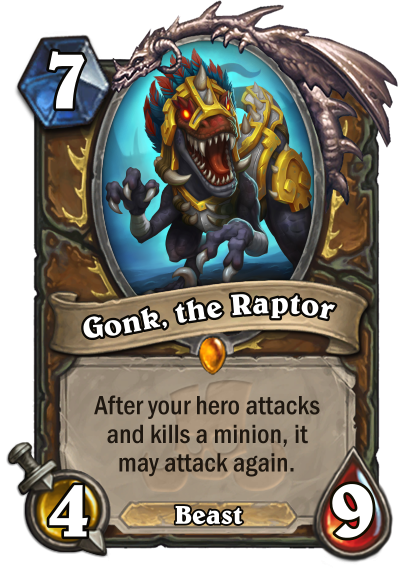 PCGamesN revealed a new Druid Legendary card called Gonk, the Raptor. The rare Shaman minion was revealed by Japanese YouTube channel TansokuCH. The Epic card was unveiled by Geek Culture. 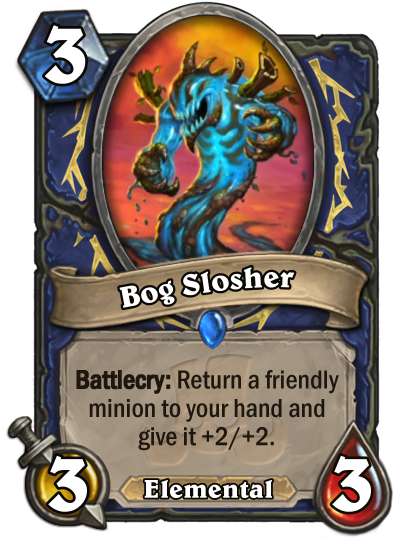 bog slasher seems like a powerful minion. other two could be good in arena ! Bog Slosher might see play in Shudder decks instead of Zola. Its bigger, has elemental tag and buffs the target minion. 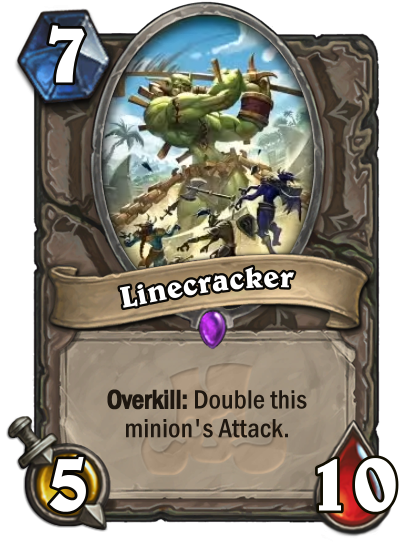 Dunno, you lose the stats of the target minion on the board which may be more than the +2/+2 you get when you replay it, so unless it’s near-death or has a good battlecry (very nice on saronite/lifedrinker I guess) zola often will be better. Also the elemental tag can be a downside if you’re using the draw an elemental minion to tutor for grumble. You are right about losing stats on board, but I've never really attacked by Shudder before. They just play 10 of them, so I just concede. Drawing this with Sandbinder will not be bad, as this will be a part of the combo. If you don’t get attacked by it then when it comes back later with +2/+2 and doesn’t attack you again, the +2/+2 doesn’t seem very important anyway! In any case you may be right, I never found a shudderwock so I’ve never tried it myself. Grumble seems a higher priority find than zola is all. Hopefully the card reveal for Wockymunch (neutral rare untargetable 3 mana 3/3 beast with battlecry ‘Destroy all copies of enemy Shudderwocks wherever they are and gain their stats.’) is coming soon to render this all moot.